Crealabs has been developing profitable web sites for 15 years. Whether you need a new web site, a web application or assistance with a problem you're facing, don't hesitate to contact us. Get the website you want, in time and on budget. We have experience building e-commerce websites in the US and Canada, with sales volumes of up to $30 M per year. You want to optimize your internal processes, vendor relations or cleint relations? We can help. We can also build simpler, non-transactional websites that represent your organization. These are generally managed with Content Management Systems (CMS) like WordPress. Save time and money with our expert advice. We can analyze your e-commerce expenses (shipping fees, web hosting, payment processing, etc.) and make recommendations that can lead to major savings. We can review your business processes (web site updates, order processing, etc.) and help you make them more efficient. We can also help with one-time problems that you're facing. 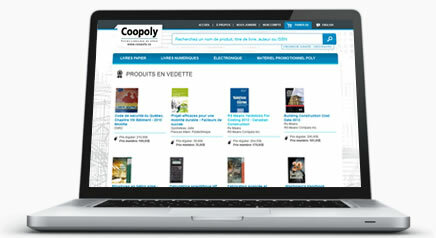 We were asked to build a brand new website for Coopoly, a university cooperative bookstore, in 2008. Thanks to the easy-to-use website that we developed and which we integrated with the cooperative's inventory system, Coopoly's online sales increased substantially. Their new site paid for itself in less than a year. We rebuilt it to add ebooks to the inventory in 2013.